You are here: Home / Everyday Posts / HGTV Presents Santa HQ! It isn’t too late to get that iconic photo of your kids and Santa! HGTV has once again outdone themselves with the Santa HQ display at locations across the country. 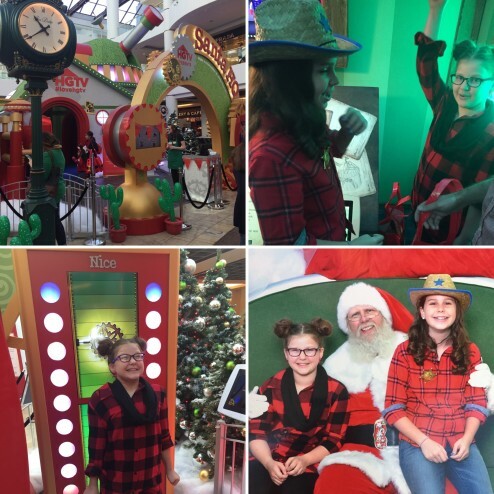 My family was invited to walk through Santa HQ at Scottsdale Fashion Square in Scottsdale, AZ. Even though the kids are starting to feel like they’re a bit too old for this Santa business… they loved being scanned by the electronic “Naughty/Nice” meter upon their arrival. We also were able to create an adorable holiday family video where we “elfed” ourselves. The video was emailed right to me. How adorable is that? And finally- they were able to explore the secret wonders in Santa HQ by using a tablet as a viewer and discovering hidden elves, gifts, and starlight displays! Our family took a few photos without Santa as we exited Santa HQ and then as we rounded the corner, the big guy was waiting with open arms for the children! And while Allison didn’t want to sit on his lap, it’s an adorable memory, just the same. HGTV paid close attention to every detail, making Santa HQ feel warm, homey, and full of magical mystery. Find a location near you and make photo reservations today, before Santa packs up and heads back to the North Pole! *Note: We were invited as a guest of Scottsdale Fashion Square to tour the event. I was not compensated for this post.